I’m Virginia Wells, your supportive Professional Organiser. I shine light into the dark corners of your clutter and offer you direction and guidance with your secret stash of stuff. I bring ease and purpose to your home and workspace. I bring calm and clarity to your chaotic spaces and crowded mind. Isn’t it time you prioritised your life? Created a life and home that reflects who you are and where you want to be? I’m here to help you do just that. I’ve been called a magical pixie fairy. Really. Let me sprinkle some magic into your home and office, and add a dose of empathy, compassion and understanding to your overwhelm to alleviate that stress. A tidy up is more than just physically moving things, getting rid of stuff and organising. Sometimes ‘stuff’ comes up. Emotions bubble, and fears can arise. That’s perfectly normal and it’s good to know you’re with someone you can trust. You won’t have to venture to places you don’t want to. I will support you for the individual you are with my non-judgemental style. I feel so privileged to be invited into your personal space and I totally respect your privacy. I’ll keep things confidential. I will empower you with the tools and techniques to kick start your smooth sailing system. A calmer, more confident you, back in control of your living and workspace and your life. Beautiful. And we get to have some serious fun along the way! As I’ll be learning a lot about you whilst working with you why don’t I share a few snippets about me so you know some of my secrets? I enjoy deep, hearty laughs that we do so rarely as adults… you know, when you’re laughing so hard you cry? Magical and so freeing! I followed one of my secret desires a few years back. To become a bellydancer. Now I perform regularly with my wonderful dance friends at Floriade and the National Folk Festival here in Canberra. I love bellydance! My mum (who isn’t a hairdresser) cut my hair so short one year that I had a boy’s haircut for a few years… awesome. I studied a Bachelor of Science, Psychology. The mind is so vast! It’s interesting to have a little insight into what’s going on in there. Since uni, I have undertaken many mindfulness classes, meditations and yoga practises. I think it’s important to learn to be mindful and connected to yourself. Professionally, I’ve held various jobs that have included organising, decluttering, process improvement, research & administration. Check me out on LinkedIn if you’re interested in the detail. I am currently the ONLY Canberra Accredited Member of the Institute of Professional Organisers (IOPO) in Australia. 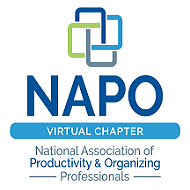 I am also a member of the Institute for Challenging Disorganization (ICD), the (American) National Association of Productivity and Organizing Professionals, and have undergone specialist training to work with people who are hoarders. I have a Working with Vulnerable People Card, and am a NDIS Provider. You can see I’m open and transparent in my interactions, which is only fair as you’re opening your home to me. I look forward to hearing your story. Contact me to discuss your situation.